A group calling itself Youth for DPP-UDF Alliance has issued a letter lobbying the two parties to join forces ahead of the May 21 Tripartite Elections to contest as a united front. The letter, dated January 30 and signed by the group’s interim chairperson Taweni Mtambo and his vice Linda Chisemphere, is specifically addressed to President Peter Mutharika who is the governing Democratic Progressive Party (DPP) candidate and Atupele Muluzi, who leads United Democratic Front (UDF). 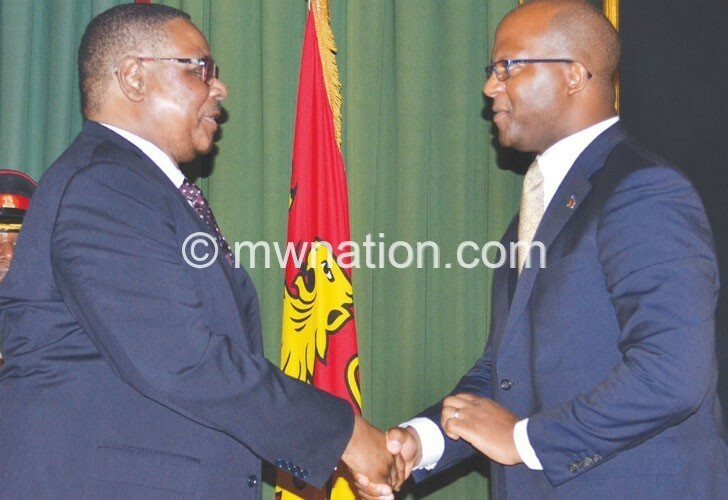 The letter stresses that unity will give the two parties will give them strength and better their chances against their opponents, such as the Malawi Congress Party (MCP) which it says came close to DPP in an opinion commissioned by Centre for Multiparty Democracy (CMD) last year. The poll pegged DPP chances of victory at 27 percent and those of MCP at 24. “Politics, under any democratic system, is a game of numbers. Not numbers that overflow political rallies to hear manifestos and entertain themselves with free music shows, and surely not numbers of Facebook followers, likes, tweets and retweets. It is a game of numbers that show up at the polling centres and cast their votes for the leader they either love or want to give a chance to,” reads the letter in part. Further, the letter warns that failure to strike an alliance now will be regrettable as the two parties’ chances of winning single-handedly are minimal. “…we find it a complete lack of foresight for those that may be advising against the alliance on either side. The political landscape in Malawi has and continues to become delicate that if we continue working in isolation, we may soon face extinction from the political arena,” it adds. In an interview with Weekend Nation, Mtambo confirmed having authored the letter with other concerned youths and said he delivered it on Thursday to State House, publicity secretaries and secretary generals of the two parties. “We started doing the consultations of lobbying the two parties to form an alliance two months ago and about 90 percent of the youth in both parties support the idea,” he said. Mtambo said there are some unfounded fears that some quarters within the two parties are of the view that working together will ruin the parties. “Far from it, working together will create a formidable force of the two parties that will take the country further forward. As the youth, our primary focus is not only on this election but also what will happen in the future-15 to 20 years from now. We dream of a time when we shall have one big party capable of amassing 3 million votes during elections,” he added. However, the governing DPP said it is yet to receive the letter. The party’s spokesperson Nicholas Dausi declined to comment when we called him on Friday. On his part, UDF spokesperson Ken Ndanga also said he has not received it but has seen it on social media.